Create a modern look in your home with this luxurious swivel arm chair. Plush seating, and quality construction will make this piece a favorite. Wide track arms and large block feet make a modern statement. Made in America, this upholstered swivel arm chair will quickly become a staple in your living room. The 0870 Contemporary Upholstered Swivel Chair with Wide Track Arms by McCreary Modern at AHFA in the area. Product availability may vary. Contact us for the most current availability on this product. Fabric Options Available in an Assortment of Fabrics and Leather Options. Fabrics in This Collection are Carefully Chosen for Style and Durability. Arm Wide modern track arms. Leg or Skirt Swivel base, no wooden feet. The 0870 group will help you create a modern style in your living room. 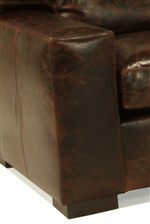 Plush seating and quality construction make these stylish American-made upholstery pieces a great fit for your home. The 0870 collection is a great option if you are looking for Contemporary furniture in the area.